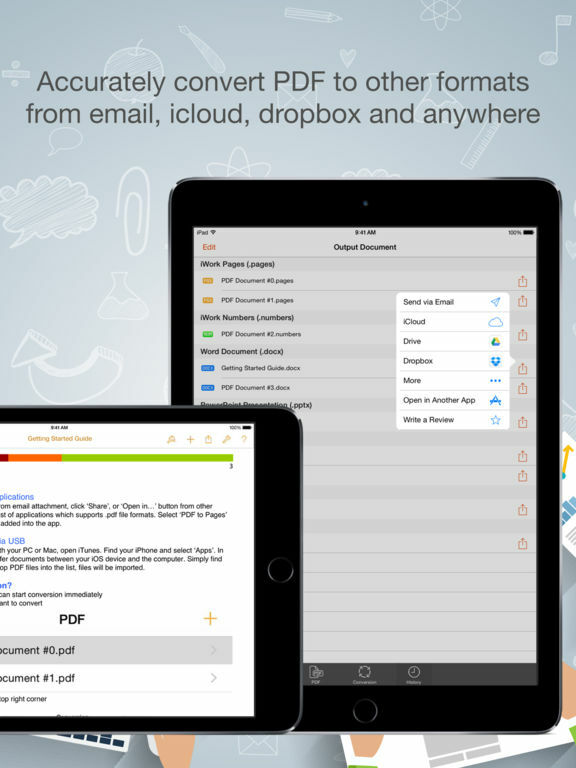 Convert your PDF files into iWork, Office quickly and accurately. 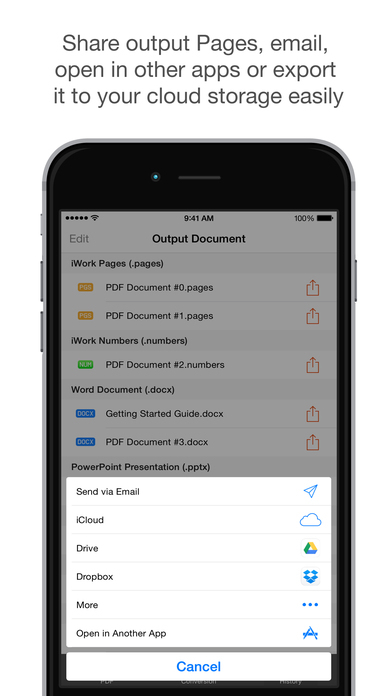 8 output formats meet all your conversion needs, including Office (docx,xlsx,pptx), iWork (pages,numbers,key), rtf, and txt. It will preserve the original formatting as accurate as possible, text content, images, multi-column, tables and even the most complex formatting can be well retained. So you don’t need to spend lots of time adjusting the output documents. Once installed, PDF Converter Master appears in the 'Open In…' list on your device, so you can add source PDF from Mail attachment or any other applications on your device. 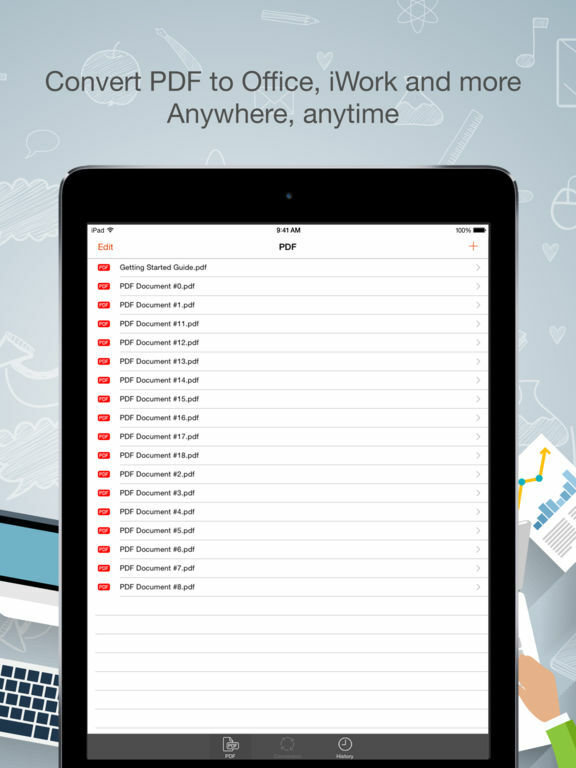 You can also add PDF files from iCloud or other cloud storage like dropbox, googledrive. It takes only 3 steps to convert PDF: Add PDF file, select output formats, and then click 'Convert' button and done. Whenever you've converted the document, you can save the output file to iCloud Drive, or keep it in the app for future usage. You can also open the output file in other applications, such as ‘Word’, ’Pages'; or send it as attachment via email. 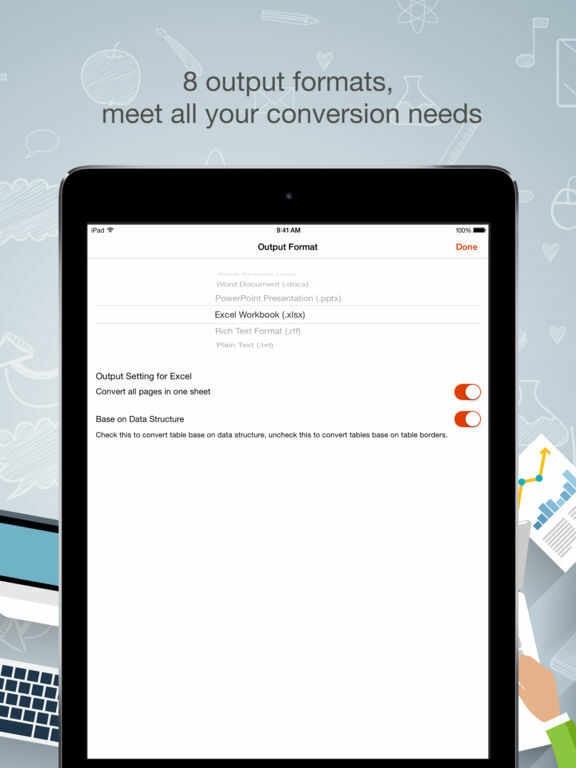 Conversion process is 100% secure since conversion is done locally on your iOS device. You don't even need internet connection to get the conversion done, so the confidentiality of your data is safe. There's no file size limitations, you don't need to wait for hours for the delivery of the output files. 8 output formats meet all your conversion needs, including Office (docx,xlsx,pptx), iWork (pages,numbers,key), rtf, and txt. This version doesn't have OCR function, so scanned or image-only PDF will be converted into image in output file instead of editable content.